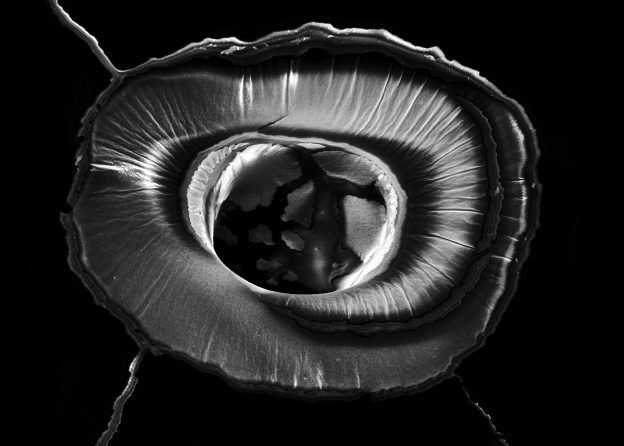 “My art practice involves an interplay between photography and scientific imaging, and is concentrated in the specific area of scientific photography made by the Scanning Electron Microscope (SEM), which has expanded the boundaries of observation and representation of the micro world. My work in the field of photomicrography aims to expand human visual vocabulary, revealing principles of beauty which are typically difficult to otherwise access”. New media artist, Anastasia Tyurina, is an Associate Professor at the National Research University of Electronic Technology, Moscow and a sessional academic at Queensland College of Art, Griffith University, Brisbane. 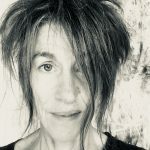 Anastasia Tyurina: I am a new media artist, currently an Associate Professor at the National Research University of Electronic Technology, Moscow and a sessional academic at Queensland College of Art, Griffith University, Brisbane. I hold B. Ed Visual Arts (Moscow Region State University), MA Photo Journalism, (Moscow State University), PhD (QCA, Griffith University). Throughout my academic and artistic career, I have been interested in obtaining new knowledge of the relationship between science and art. Therefore, I use scientific machines, particularly X-rays devices and microscopes, in a variety of art projects. My interest in microphotography has many roots. I got presented with a very simple microscope when I was 5 years old; since then I could spend hours looking at what I was collecting in nature – seeds, mosquitoes’ heads, butterfly’s wings, etc. One day I realised how much humans are limited with their vision ability. We can’t see the complex structures of objects beyond the scale our vision allows us to see. From then on the microscope became my essential tool for experiments in seeking the ‘invisible’, which is outside of direct sensation such as touch and human interaction. More than that, I wanted to capture my surprising discoveries and share them with others. That is, the journey into photography began. RB: Have there been any particular influences to your visual art project? AT: My art practice involves an interplay between photography and scientific imaging, and is concentrated in the specific area of scientific photography made by the Scanning Electron Microscope (SEM), which has expanded the boundaries of observation and representation of the micro world since it was introduced to scientific research in the mid-1960s. 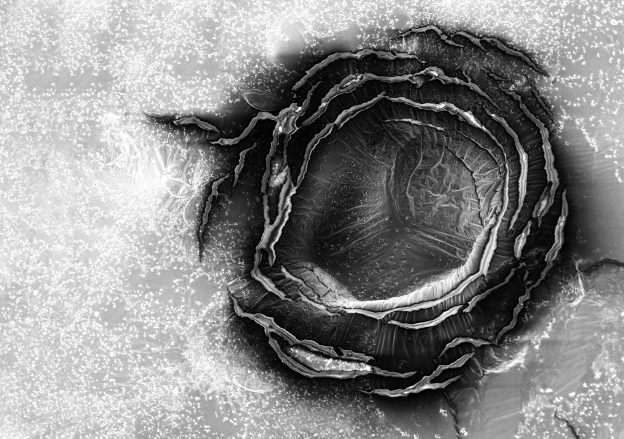 Like a number of other artists who have gone before me, I investigate how to interpret scientific images captured by the SEM as aesthetic forms. At the earlier stage of my practice, I was hugely influenced by Karl Blossfeldt and his lifelong interest in plants. Blossfeld used his homemade camera to capture plant forms. His selection of plants was related to ‘classical’ Greeks ideal forms which he used as a teaching aid in the drawing classes at the Kunstgewerbemuseum (College of Arts and Crafts) in Berlin and incorporated these studies into his teaching curriculum. Another great inspiration came from the American photographer Wilson A. Bentley, one of the first known photographers of snowflakes who also built his own camera and connected it to a microscope in order to create photomicrographs of snow crystals. My theoretical framework is formed by works of Laszlo Moholy-Nagy, Albert Renger-Patzsch, Jean Painleve and Gyorgy Kepes who are all examples of how art, unlike science, seeks a symbolic dimension in addition to knowledge of the physical world. A number of contemporary artists work in the field of scientific imaging and photomicrography which allows them to get records of the nature in unfamiliar way of presenting. 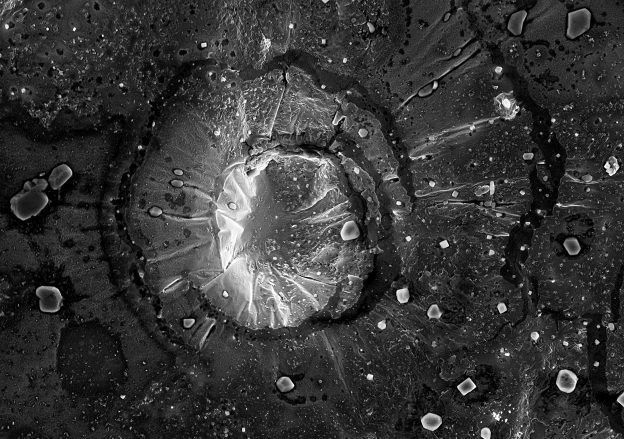 For example, Dee Breger explores the ‘compound reality’ in nature of SEM photomicrographs. She believes that the microworld exists beyond our cognition; its beauty is hidden but it can be explored using appropriate tools, such as the SEM. 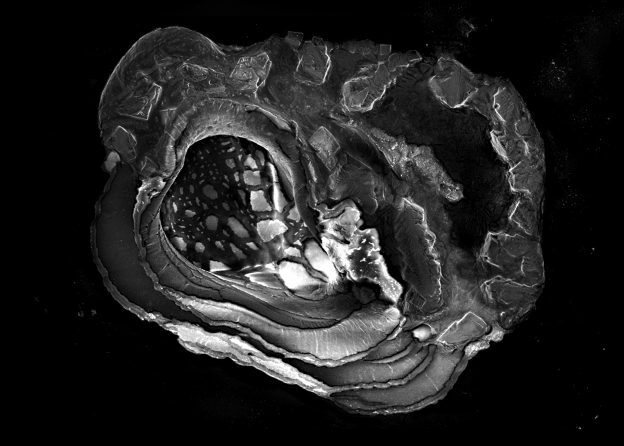 The artist Claudia Fährenkember also uses the SEM as a medium for some of her works. In her black-and-white series of photographs Planktos, created from 2005 onwards, she was inspired by Ernst Haeckel’s illustrations of marine life in his book Kunstformen der Natur, which was released in 1904. AT: My work in the field of photomicrography aims to expand human visual vocabulary, revealing principles of beauty which are typically difficult to otherwise access. By exploring the interplay between the indexical and iconic modalities in scientific photomicrographs, I try to imbue them with new meanings. By enhancing their aesthetic presentation, I use scientific photography as a creative process of science communication aimed at the general public. My project explores images produced by micro-scale drops of water from different aquatic systems after evaporation. This is done in an attempt to discover morphological features of the visual patterns related to water contamination. 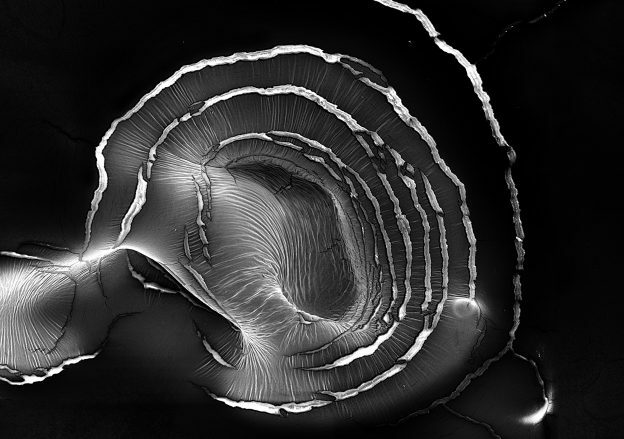 My artistic intervention into a scientific process through experimenting with the SEM is a way to find what potentially different things my images can reveal about water to a viewer. RB: Scientific photography is commonly perceived as a way of recording scientific data through various photographic techniques. What do you aim to communicate to your audience through your art? AT: Originally being a technical discovery, photography has been widely used in almost all fields of human activity, acting as a research tool and as an independent artistic direction. Modern times offer “modern” interpretations of scientific photographs and attitudes toward them. Scientific photomicrography is a powerful tool for receiving and storing information and for providing solutions to a variety of tasks in many areas of science and technology. At the same time, the artistic application of photomicrography is capable of revealing a set of complex and interrelated principles that underlay the materiality of the human environment. Photomicrographs also expand human visual vocabulary, revealing principles of beauty which are difficult to access with the naked eye. In last decades, there have been increasing concerns over the ecological management of water. Waterway pollution is recognised as placing urban ecosystems around the world at risk. Rainfall that washes oils, metals, and nutrients directly from streets into rivers and seas is hard to treat (De Haan et al. 2015). This is a challenging problem for science and technology. The health and well-being of present and future generations are dependent on how quickly and well it is managed. There is also an opportunity to explore some concerns related to the environmental impact of water pollution in an artistic context. Photomicrography has a particular potential to respond to this issue from both a scientific and a cultural perspective. 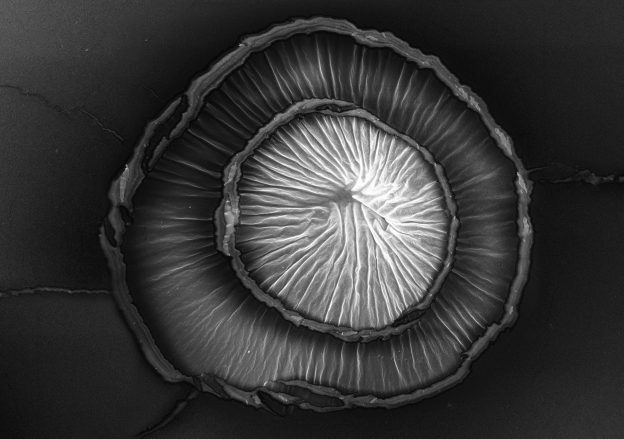 SEM-made photographs are capable of visually representing features related to water composition and, in some cases, the contamination of water. At the same time, they can transmigrate from science into the domain of art and draw attention to water issues as well as to communicate the significance of water. I believe an interdisciplinary approach is the most appropriate one for deepening knowledge about unique properties of water and building a sustainable practice of water management through enhanced visualisation of water contamination. My focus is on interconnected artistic thinking and by developing alternate forms of visualisation, I aim to transcend disciplines and contribute to the new ways of seeing water. RB: Can you say something about your photomicrography working methods?